Welcome to the uncomfortable world of male pregnancy. If you’re from the Austin, Texas area, you’re probably familiar with Pluckers Wing Bar. But you may want to pass up a visit after Pluckers’ latest tweet, lest you grab a side of male pregnancy with your wings. On Monday night, the official @Pluckers Twitter account posted a picture of Phineas Flynn from Disney Channel’s Phineas and Ferb with a bulging, seemingly pregnant belly. 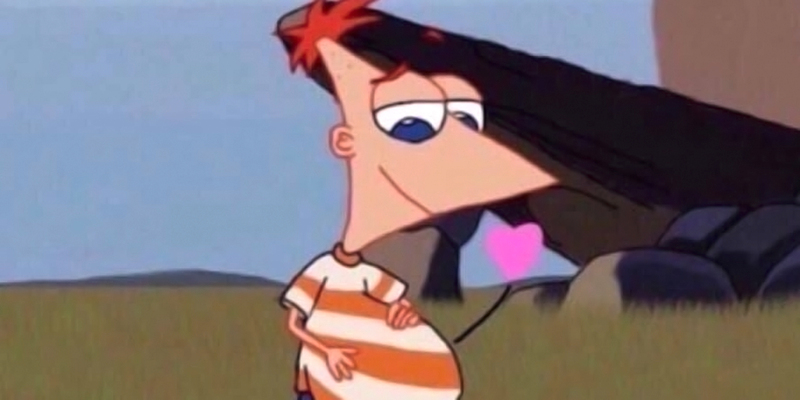 Phineas, who is presumably teenaged or younger, has both of his hands on his comically enlarged stomach and is looking down at it, smiling, along with a small heart next to his face. @Pluckers captioned the picture with: “me after all you can eat wings.” It racked up over 2,800 retweets, 7,700 likes, and over 1,000 replies. For the uninitiated, @Pluckers’ tweet is a fetish edit seemingly referencing one or more kinks: “mpreg,” or male pregnancy, “feederism,” or sexual gratification from consuming a large amount of food, and/or “voreaphilia,” or sexual gratification from consuming another person. All three kinks are particularly common in fandom circles, with male pregnancy regularly satirized on the internet. Case in point, here’s SpongeBob pregnant with Shrek’s baby. Anyway, Pluckers’ tweet isn’t going viral just because it’s a kink edit: it’s 18+ artwork of an underage character. Phineas is at least under 15 years old according to the Phineas and Ferb Fandom Wiki. Add fetishism into the mix, and Twitter showed zero chill toward Pluckers’ tweet. Others were tortured with their forbidden knowledge about mpreg and feederism. They understood why the @Pluckers tweet is going viral, and yet, they couldn’t reveal their Extremely Online exposure to the DeviantART kink world. im so torn about pluckers because on one hand its hilarious that a corporation would just post phineas and ferb mpreg out of nowhere, but on the second hand hes a child and then on the third hand this is just what corporations want. They lure us in using the mpreg. Some even wondered if Pluckers was aware that the meme was a kink post of an underage character. It’s unclear for now. But if brands are turning toward depression and kink edits of children’s cartoons to reach customers, late capitalism is about to get very interesting.